Wondering what makes The Groutsmith the leading name in grout and tile cleaning and restoration nationwide? Visit the links below to read through real success stories, peruse frequently asked questions and find the nearest Groutsmith location near you to experience our professional service yourself. 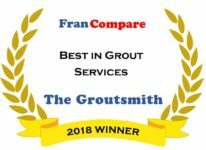 Do you have questions about The Groutsmith franchise opportunity? Check out thes FAQs to learn more about what The Groutsmith has to offer. We’re growing all the time. Want to experience our professional service for yourself? Find a Groutsmith near you.